Temple Grandin. Photo courtesy of Rosalie Winard. What are the biggest challenges faced by small-scale farms? For small-scale farms, land access is a problem. But you can’t go into farming without land. Taxes are absolutely crazy. Family ranchers are selling out. Networking is a challenge too when you’re on your own. Farmers and rancher need to network. Especially for small scale farms, networking is very valuable. What’s your advice for small-scale farmers and ranchers? One of the things the small farmer needs to do is have a niche that the big companies don’t fill. The big guys are too big and clumsy to fit into these niches. Find a specialized niche—natural, organic, grassfed, etc.—and develop the market. Sell locally. Sell to a large population center. That can make a real good living. Is the large-scale agriculture industry a threat to small farmers? I think there’s a place in agriculture for everyone. Down the road, there’s going to be some things the big boys have to learn from “Small Ag.” Their way works in the short run, but they are going to have to start thinking about incorporating small-scale methods, such as cover cropping. It requires more work, but it’s very important. Why do you support the National Young Farmers Coalition? Farming is very, very hard work. To make those businesses work, you’ve got to be willing to work really hard. You don’t always have time to watch the news or read the paper. You can’t keep track of government decisions about the Farm Bill or figure out how to meet other farmers. “Big Ag” has lobbyists for that. Small-scale farmers have the National Young Farmers Coalition. 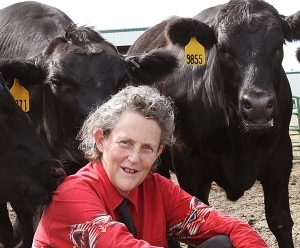 Temple Grandin knows that running a small-scale farm or ranch is complicated. With the National Young Farmers Coalition in your corner, there’s a lot less you need to worry about. Count on us to make your farm business work. I hope we can count on you: join or renew as a sustaining member today.